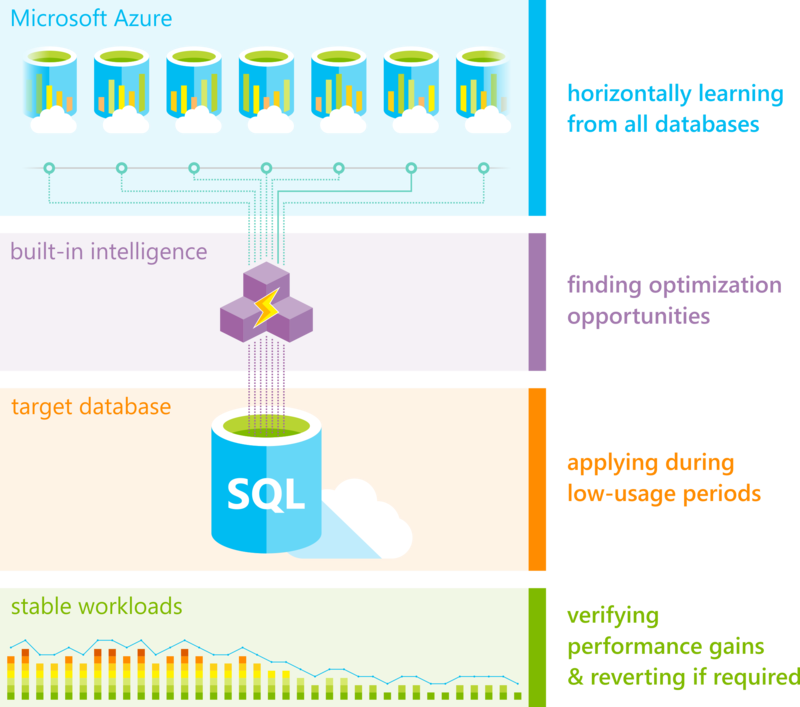 Azure SQL Database Automatic tuning provides peak performance and stable workloads through continuous performance tuning based on AI and machine learning. Automatic tuning is a fully managed intelligent performance service that uses built-in intelligence to continuously monitor queries executed on a database, and it automatically improves their performance. This is achieved through dynamically adapting database to the changing workloads and applying tuning recommendations. Automatic tuning learns horizontally from all databases on Azure through AI and it dynamically improves its tuning actions. The longer an Azure SQL Database runs with automatic tuning on, the better it performs. Azure SQL Database Automatic tuning might be one of the most important features that you can enable to provide stable and peak performing database workloads. What can Automatic Tuning do for you? Tuning operations applied to Azure SQL databases are fully safe for the performance of your most intense workloads. The system has been designed with care not to interfere with the user workloads. Automated tuning recommendations are applied only at the times of a low utilization. The system can also temporarily disable automatic tuning operations to protect the workload performance. In such case, “Disabled by the system” message will be shown in Azure portal. Automatic tuning regards workloads with the highest resource priority. Automatic tuning mechanisms are mature and have been perfected on several million databases running on Azure. Automated tuning operations applied are verified automatically to ensure there is a positive improvement to the workload performance. Regressed performance recommendations are dynamically detected and promptly reverted. Through the tuning history recorded, there exists a clear trace of tuning improvements made to each Azure SQL Database. Azure SQL Database Automatic tuning is sharing its core logic with the SQL Server automatic tuning engine. For additional technical information on the built-in intelligence mechanism, see SQL Server automatic tuning. Automatic tuning needs to be enabled on your subscription. To enable automatic tuning using Azure portal, see Enable automatic tuning. Automatic tuning can operate autonomously through automatically applying tuning recommendations, including automated verification of performance gains. For more control, automatic application of tuning recommendations can be turned off, and tuning recommendations can be manually applied through Azure portal. It is also possible to use the solution to view automated tuning recommendations only and manually apply them through scripts and tools of your choice. Automatic tuning identifies CREATE INDEX, DROP INDEX, and FORCE LAST GOOD PLAN recommendations that can optimize your database performance and shows them in Azure portal, and exposes them through T-SQL and REST API. To learn more about FORCE LAST GOOD PLAN and configuring automatic tuning options through T-SQL, see Automatic tuning introduces automatic plan correction. You can either manually apply tuning recommendations using the portal or you can let Automatic tuning autonomously apply tuning recommendations for you. The benefits of letting the system autonomously apply tuning recommendations for you is that it automatically validates there exists a positive gain to the workload performance, and if there is no significant performance improvement detected, it will automatically revert the tuning recommendation. Please note that in case of queries affected by tuning recommendations that are not executed frequently, the validation phase can take up to 72 hrs by design. In case you are manually applying tuning recommendations, the automatic performance validation, and reversal mechanisms are not available. In addition, manually applied recommendations will remain active and shown in the list of recommendations for 24-48 hrs. before the system automatically withdraws them. If you would like to remove a recommendation sooner, you can manually discard it. Automatic tuning options can be independently enabled or disabled per database, or they can be configured on SQL Database servers and applied on every database that inherits settings from the server. SQL Database servers can inherit Azure defaults for Automatic tuning settings. Azure defaults at this time are set to FORCE_LAST_GOOD_PLAN is enabled, CREATE_INDEX is enabled, and DROP_INDEX is disabled. Configuring Automatic tuning options on a server and inheriting settings for databases belonging to the parent server is a recommended method for configuring automatic tuning as it simplifies management of automatic tuning options for a large number of databases. To enable automatic tuning in Azure SQL Database to manage your workload, see Enable automatic tuning. To manually review and apply Automatic tuning recommendations, see Find and apply performance recommendations. To learn how to use T-SQL to apply and view Automatic tuning recommendations, see Manage automatic tuning via T-SQL. To learn about building email notifications for Automatic tuning recommendations, see Email notifications for automatic tuning. To learn about built-in intelligence used in Automatic tuning, see Artificial Intelligence tunes Azure SQL databases. To learn about how Automatic tuning works in Azure SQL Database and SQL server 2017, see SQL Server automatic tuning.